Place the cashews in a medium heatproof bowl and cover with boiling water. Set aside for 15 minutes to soak. Drain the cashews and place in a food processor. Add the coconut oil and maple syrup and process for 2 minutes or until smooth and creamy. Add the cacao and process for 1 minute or until smooth. 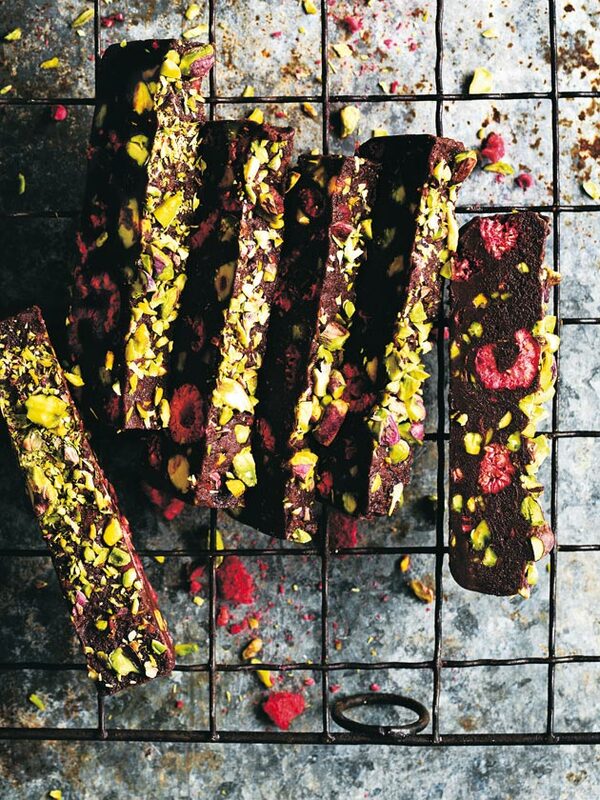 Transfer the mixture to a large bowl, add the raspberries and ½ cup (70g) pistachio and gently stir to combine. Spoon into a lightly greased 20cm x 10cm loaf tin lined with non-stick baking paper, smoothing the top with the back of a spoon. Top with the remaining pistachio and gently press to secure. Refrigerate for at least 4 hours to set. Slice to serve. Makes 16. You can store this fudge in an airtight container in the fridge for up to 1 week.